System Hygiene Coarse Brown Rock Salt, is the ideal low cost solution to ice and snow de-icing. The blend of coarse rock salt, sand and special ice melting additives quickly and effectively clear ice and snow. The product can also be used as a preventitive measure, being spread on car parks, paths, pavements and walkways before the onset of ice, ensuring slippery conditions and accidents don't have time to occur. 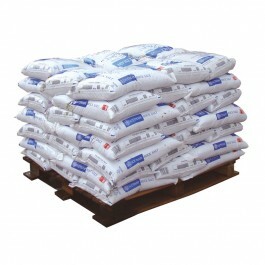 Pallet deal containing 50 large bags of coarse brown rock salt at a special, cut down, price. Each bag weighs approximatley 20-25kg. Pure White Rock Salt special deals also available.